"Quick and easy tempura vegetables make for a great appetizer or side dish. Recommended vegetables are: bell pepper slices, green beans, bite-sized broccoli or cauliflower, mushrooms, and zucchini strips. To ensure the batter sticks well to the vegetables, make sure they have been washed and dried thoroughly." Whisk flour, baking soda, baking powder, and salt together in a large bowl. Pour in sesame oil, soy sauce, and club soda; mix briefly until a loose, lumpy batter forms. See how to pickle grilled cucumbers and red peppers. Substitute beer for the club soda if desired. Heat oil in a deep-fryer or large saucepan to 375 degrees F (190 degrees C). 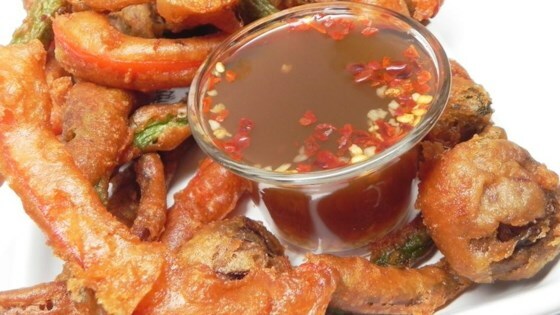 Dip your choice of vegetables in tempura batter and deep fry in batches until golden brown, about 3 minutes.